Developing the World’s Most-Used Cross-Platform CAD and BIM Software: An Interview with Vectorworks expert Eric Gilbey. With many options in computer-aided design (CAD) software, how do you know you’re using the right one? To find out, we turned to a software expert in the architecture, landscape architecture, planning, and urban design field. With more than a half-million designers across upwards of 85 countries using its products, Vectorworks is on a mission to develop the world’s best cross-platform CAD and BIM software. During its 30 years in business, it has been one of the first to promote BIM capabilities. 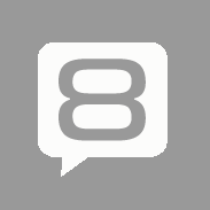 ERIC GILBEY, PLA ASLA, LANDSCAPE ARCHITECT SPECIALIST AT VECTORWORKS, INC.
LAN: Tell me about Vectorworks. How was the company started? Was it originally developed for landscape architects? Vectorworks: The software was called MiniCad when the company started in 1985. The initial intention was to offer a 3D CAD solution and a specific market wasn’t targeted, but the early adopters were architects, and we later added 2D capabilities. 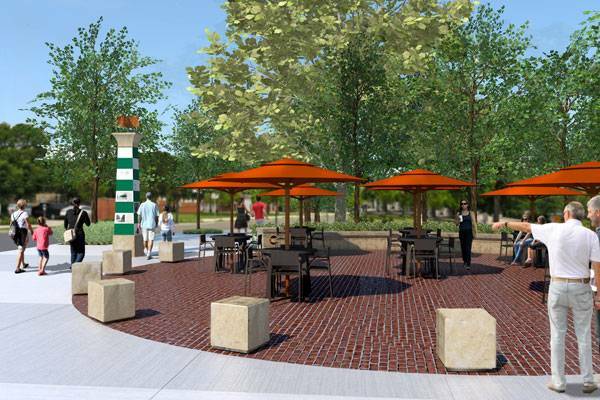 When architects started using CAD technologies, landscape architects were pulled in. as well. In the late 1990s, we were acquired by our parent company, the Nemetschek Group of Munich, Germany. In 2000-2001, we started to introduce industry-focused products, and it’s been that way ever since. LAN: What are the primary advantages to using Vectorworks? 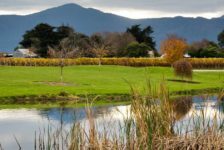 Why should landscape architects choose your software over your competitors? 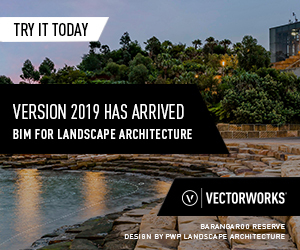 Vectorworks: Most of our users choose our industry-specific Vectorworks Landmark product because the software runs more intuitively compared to other software. 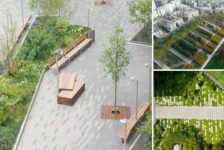 For example, Vectorworks allows landscape architects to model with smart objects, which directly relate to the design of the project and include hardscapes, landscape areas, planting design, walls, and more. The biggest advantage to using Vectorworks is the integrated workflow, which merges 2D and 3D, smart objects, built-in rendering capabilities, and freeform modeling. 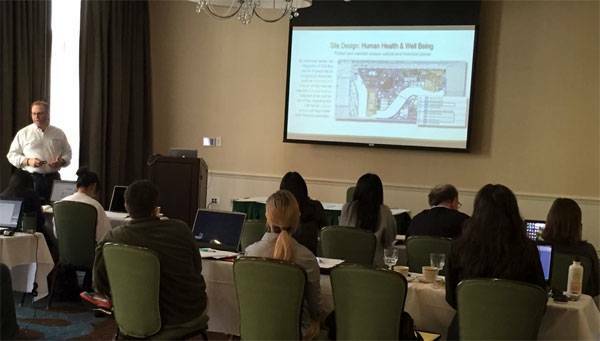 Gilbey leads a hands-on workshop during a continuing education session for professionals and students at the University of Georgia this past October. LAN: Is there a particular sector that has embraced Vectorworks? Why? Vectorworks: Vectorworks products are put to work in more than 85 countries in 10 languages. Besides English, Vectorworks products are currently available in Chinese, Japanese, German, French, Dutch, Italian, Spanish, Portuguese, and Norwegian. On the customer level, there is a good mix from private practices to government and even schools. 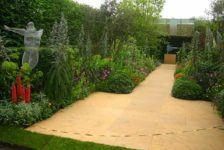 With that said, a majority of users are practitioners at firms with 20 or fewer people focused on landscape architecture, design/build, land development and planning, garden design, the landscape contractor, and even a small number of civil engineering firms. We hear that people think our software is only made for small projects, which is not true—it’s really made for both small and large projects. We have users doing GIS work, urban design, site information modeling, and land planning with Vectorworks software. CYP Studios and Morris take advantage of Vectorworks’ ability to cut sections from 3D models for installation details. Image courtesy of CYP Studios and Morris. The design team repurposed the Patterson Canal logo as medallions on a 1,250-square-feet brick paver seat wall. 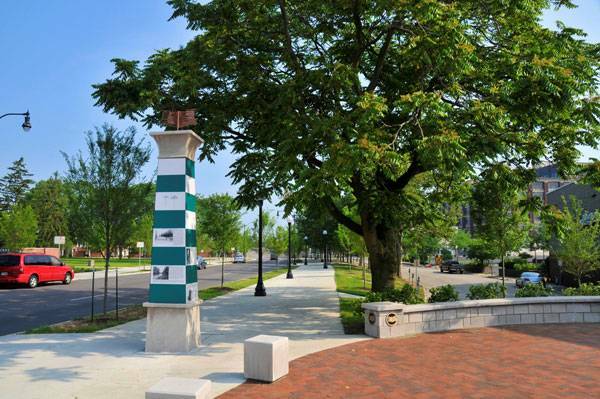 Nearby, a dozen 12-foot-tall vertical pylon elements provide strong visual cues for pedestrians that they are in the Patterson Canal Corridor. Photo courtesy of CYP Studios and Morris. LAN: Name a few examples of landscape architecture projects that have been completed using Vectorworks. How did this software save time, money, and resources? 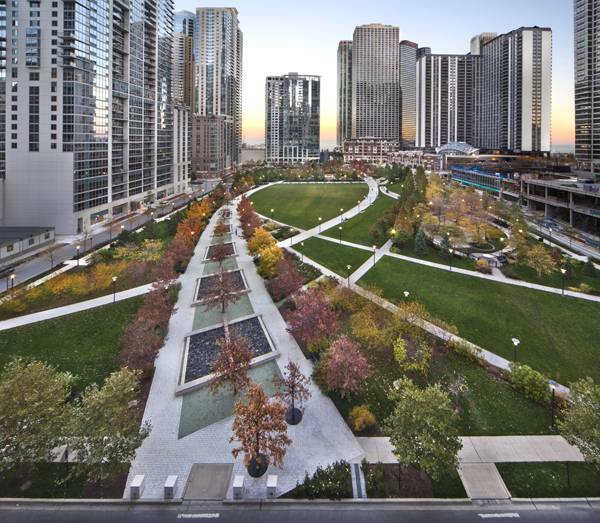 Vectorworks: The Park at Lakeshore East in Chicago, designed by The Office of James Burnett, used Vectorworks from start to finish. The graphic sense of the software and the ease of going to construction documents in the same program made it an ideal choice. Also, Pacific Coast Land Design, Inc. (PCLD) has relied on Vectorworks for about the last five years. Recently, PCLD was called upon by the Council in Newhall, California, to re-envision the city’s main corridor, which was in decline due to the expansive Los Angeles suburbs. Ultimately, PCLD’s plan specified sustainable design elements through the use of Vectorworks Landmark design software. 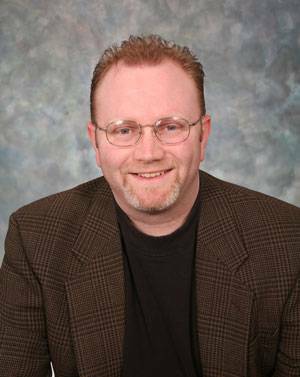 “We have to provide water budget calculations for each site, which can become time-consuming if you don’t have the right tools,” says PCLD Principal Mike Zielsdorf. “We can input all of our data into our worksheet and use smart calculations in Vectorworks Landmark to do all the budgeting for us.” “Vectorworks allows us to use one file from the start, beginning at the conceptual phase and moving into construction, all while letting us pull out reports and diagrams to communicate our design to anyone who needs to see it. Vectorworks is an incredibly important part of our process,” said Zielsdorf. LAN: What would you say to landscape architecture students debating on whether to learn Vectorworks? Vectorworks: Generally, students are eager to learn Vectorworks because they recognize the limitations of other design products on the market and therefore seek technologies like ours to improve output and remain competitive. Vectorworks is like having the best of SketchUp, Rhino, and Revit in one software tool that is also geared for the landscape architecture industry. Plus, it’s available on both Mac and Windows. For faculty who seek specific support to their curriculum with the software, Vectorworks hosts workshops at schools. We also provide students with free licenses of our software. 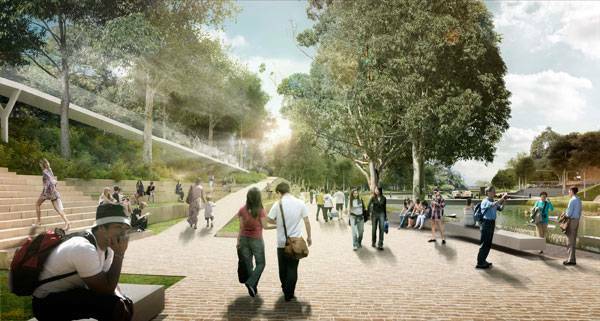 The design for Australian landscape architecture and urban design firm McGregor Coxall’s Parramatta River Urban Design strategy aims to revitalize the business district through an innovative urban realm and four dynamic, mixed-use precincts, creating an active waterfront where the city can celebrate its public life. Image courtesy of McGregor Coxall. LAN: Do you think BIM will evolve to being fully accepted and applied in the landscape architecture industry? What is the future of Vectorworks? 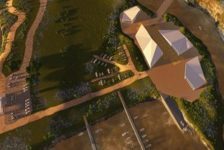 Vectorworks: We do believe it will happen in the next five years, perhaps, but it’s a slow migration for landscape architects, because some don’t understand how BIM will work for them and think BIM is for buildings. However, in terms of site design, many of our users are already using BIM. Eventually, landscape architects will be forced to use BIM, because architects will require it and architects will look for a different venture if your firm isn’t BIM-ready. 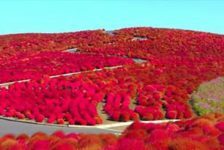 The logical extension of BIM data structures and workflows into landscape design, which is heavily data driven, will give designers an opportunity to gain the same benefit of “model once, view many times,” as well as the integrated data management of objects and plant materials. ASLA Professional Practice Network (PPN) Vectorworks webinar scheduled for January 2016 Get your free 30-day trial version of Vectorworks software here. 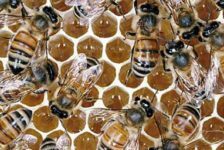 The Global Collapse in Bee Populations – What You Need to Know!